A staggering amount of policy made its way through the Capitol Hill maze — impacting everyone and every sector of the economy. The $1.1 trillion Omnibus Spending bill and the $625 million Tax Extenders package passed early Friday morning. The House and Senate then adjourned, bringing the first session of the 114th Congress came to a close. The $1.1 trillion package passed Friday morning. The “bus” carried bills with levels and conditions on spending for operations and programs across the federal government, including: many “policy riders”, the intelligence authorization bill, the Cybersecurity and Information Sharing bill (CISA), reauthorization of health benefits for 9/11 responders, repeal of the ban on crude oil exports, and much more. This year’s “Tax Extenders” package, not only continued many of the deductions and credits that are usually renewed each year, it actually made some of them permanent, in addition to changes to some Treasury Department (and IRS) policies. Permanent provisions include: the Child Tax Credit, earned income tax credit, teacher’s out of pocket expense deduction $250/yr), mass transit benefits excluded from income (same as parking benefits), state and local sales tax deduction (for people who don’t pay state income tax), the Research and Development (R&D) credit, wage credit for employers of active duty military, 15-year straight-line cost recovery for qualified leasehold improvements (restaurant and retail), section 179 property expensing, 100% exclusion for gains on small business stock, low-income housing tax credit (LIHTC). Read more about the full package. When the House and Senate gaveled down on Friday, they adjourned “sine die” (from the Latin “without day”), ending the first session of the 114th Congress. They will reconvene in January to begin the second session. Speaker Paul Ryan said the House will put Senate-amended reconciliation bill (repealing parts of Obamacare, defunding Planned Parenthood) on the House floor the first week lawmakers return in January. Expects to pass and then send to President Obama — despite veto threat. 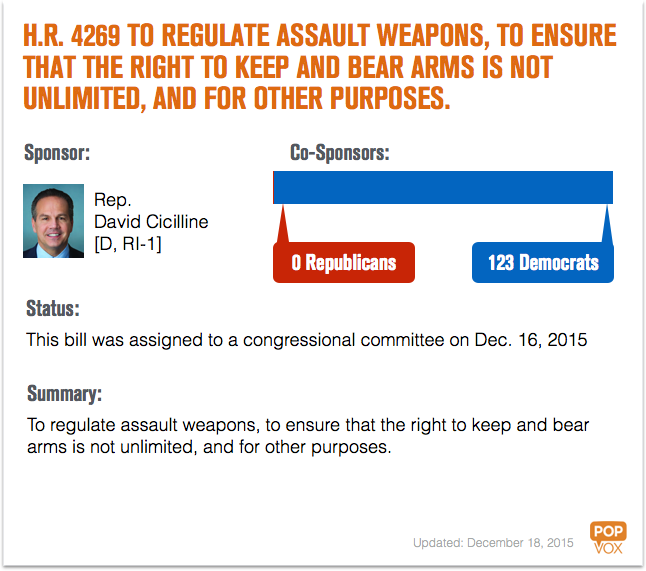 Rep. David Cicilline [D, RI] introduced a bill to renew the assault weapons ban. Sen. John McCain [R, AZ] introduced a bill that would require the Department of Homeland Security to review social media and public database in foreign background checks. House passed a bill that would require the Obama administration to submit to Congress a report on the U.S. strategy for combatting terrorists’ use of social media. Senate Majority Leader Mitch McConnell said to expect an ambitious agenda in 2016. Despite recent calls from the President and lawmakers for a war authorization, Senate Majority Leader Mitch McConnell said he doesn’t think an AUMF will see the floor in the first half of 2016 — saying he didn’t want to constrain the next commander in chief. The “average lawmaker” in America is not the stereotypical white, male, Protestant, baby boomer with a graduate degree and business background: See the legislator demographics of your state. Federal Reserve raised its key interest rate 0.25 percent — first hike since the financial crisis. Danish government is considering a law that would allow authorities to confiscate jewelry from refugees entering the country. The United Nations passed a resolution aimed at stopping ISIS from collecting revenue from oil or antiquities sales. According to NOAA, November 2015, autumn 2015, and year as a whole were all hottest on record for planet Earth. News begets news: Senate Democratic Leader Harry Reid took time on the Senate Floor to call out POLITICO story reporting his relationship with Senate Majority Leader Mitch McConnell has hit new low. From #TBT to photoshop fun to years of saying may the force be with you, lawmakers are in full swing Star Wars mania. Update: FBI Chief says San Bernardino shooters did not post support for jihad on social media. Gallup published new poll results — U.S. quality jobs outlook is the best it’s been since 2007. Senate Intelligence committee leader said they are not investigating whether Sen. Ted Cruz [R, TX] disclosed classified information during the fifth GOP presidential debate. Judge declared mistrial in case of first Baltimore officer charged in Freddie Gray’s death. The Guardian published an interactive graphic that displays gun deaths by district, along with congressional votes and campaign donations received from the gun lobby. Sgt. Bowe Bergdahl will face a court-martial for desertion and endangering troops. SCOTUS blocked an Alabama court from denying parental rights to a lesbian woman who was granted adoption in Georgia. Seattle became the first U.S. city to allow Uber (and other contract drivers) the ability to unionize. 195 nations signed a landmark deal that aims to lower carbon emissions. Details on the concrete measures included in the Paris climate deal. Also, one word almost derailed the talks. In Saudi Arabia, women were allowed to vote and run for office for the first time. More than a dozen women won seats on local councils, comprising less than 1% of council members nationwide. SCOTUS agreed to review state laws that make it a crime to refuse to take a blood alcohol test if the officer does not have a warrant. In most recent Gallup poll, Americans named terrorism as top issue facing the U.S. — highest percentage of Americans to mention terrorism in a decade.